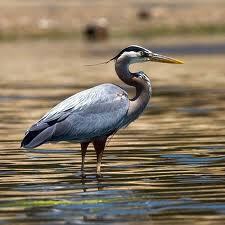 If you’ve ever seen a heron, you probably saw a great blue heron, the largest and most common heron in America. This bird has a long neck and long legs. When flying, its wings spread out and its feet trail behind. Not all herons are big though. The heron family includes over 64 species, and some of them are quite small. 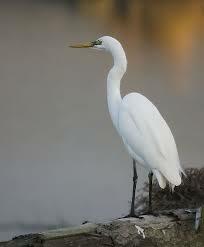 All About Herons: This bird has a long neck and long legs. When flying, its wings spread out and its feet trail behind. All herons are carnivores. Most of them eat fish, shellfish, mice and even insects. 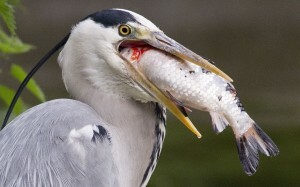 Herons often pierce their prey with their sharp beaks and then eat it whole. Sometimes herons choke because they try to eat prey that is too big to fit down their necks. Scientists have seen herons tossing seeds or fruit in the water to attract fish. Pretty smart, don’t you think? Sometimes herons choke because they try to eat prey that is too big to fit down their necks. 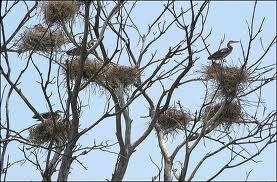 Herons build nests in colonies. The nests are made of sticks. Herons live near the ocean as well as near lakes and wetlands. Herons can live 20 years or more. Great blue herons look big, but weigh only about 6 pounds because their bones are hollow. Herons have good vision and can hunt during the night, as well as the day. Great blue herons are bluish-gray, but some herons are white. A video footage of a heron trying to eat fish. Question: Do heron males help take care of the babies? Answer: Heron males do help protect the babies. Question: What color are herons? Answer: Great blue herons are bluish-gray, but some herons are white. Enjoyed the Easy Science for Kids Website all about Herons info? Take the FREE & fun all about Herons quiz and download FREE Herons worksheet for kids. For lengthy info click here. Declan, Tobin. " Fun Heron Facts for Kids ." Easy Science for Kids, Apr 2019. Web. 20 Apr 2019. < https://easyscienceforkids.com/all-about-herons/ >.